I have a friend who keeps telling me that I make our fishing adventures sounds so- nice. 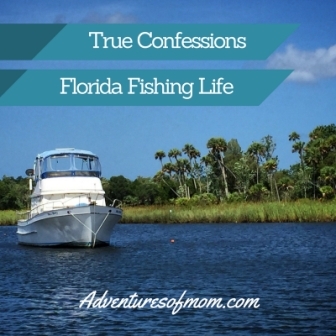 She has a fishing family and has no illusions of what really goes on when a family is out there fishing together, whether it’s in the cramped quarters of a boat or as far as possible from each other on a dock. She told me I need to write about the bad stuff- the stuff so stinky that few venture there- yes: the dark side of fishing. She is right, of course. It’s not all peachy- actually, it is never peachy and without a doubt, you always come out smelling like fish in the end. Saying that someone once said that the difference between an ordeal and an adventure is your attitude towards it. It can all be a matter of perspective! The truth about fishing is that no one actually likes to fish- they like to catch. Fishing is one long waiting game where you end up dozing off somewhere along the way- that’s why they designed those clickers on your reel- to wake you up when a fish finally hits your bait! You have to get up at an ungodly hour to bypass the crowds and end up queueing up alongside all those other folks who had the same exact plan. Everyone looks bleary eyed, in need of coffee or hung over. Some of them already smell like fish. Your kids complain about getting up early on a weekend and end up sleeping the entire day on all of the towels (or under them) and complain about not getting enough sleep when they reawaken hours later. You spend the day either freezing cold, or more likely, sweltering hot. You end up sunburned, windburned and with chapped lips no matter how much sunscreen, lip balm or cover up clothes you put on. You can be fishing from a bridge in Key West and this will still happen! If you planned ahead and have food you are well ahead of the game. I don’t care what anyone else says, but Subway Sandwiches work the best (and this is not an advertisement for them!) buy them the night before- just make sure to get that lovely oil & vinegar dressing on the side, otherwise you will have soggy sandwiches that no one will eat. But if you’re like most others, you grab food from a convenience store along the way, a gas station or the convenience section of a grocery store if one is open and hope for the best. Guess what. It’s not. It’s the worst sandwich/muffin/pastry you have ever tasted. Even the fish won’t eat it. And it doesn’t matter where you go, it always ends up that way! Go figure. There’s nothing to do on the dock except wait, erase old photos from your phone and talk to the other people on the dock about how there used to be a lot of fish and there doesn’t seem to be any now. If you are smart, you brought a chair and snacks. This is gonna be a long day! You can relieve some of the boredom with jigging- casting out with a fake rubbery bait and reeling it back in -over and over again, but there’s only so many times of doing that before you get bored of that as well or your shoulder begs you to stop. If you are a guy, you can stand and pee over the edge. And all the boys, big and little adore this fact and proudly do so. However, if you are a gal, and there’s no “head” (that’s a toilet on a boat), you will try and hold it as long as humanly possible or jump in the water for a pretend swim just to relieve yourself- but if you’re in shark areas or swamp, and swimming is most definitely NOT an option, it’s a bucket thing and so totally embarrassing. The guys will rag you about it. Always. Hold a towel up for privacy. And prepared to get ribbed afterward for your modesty. Seriously, we get the periods, PMS, the nine months of carrying babies, childbirth and the after effects and we can’t even get a decent way to pee discretely?!! Sheesh! Cut us gals a break somewhere! You put up sun shade everywhere- an extra umbrella, towels to bury your already roasted head under. You put ice under your hat to cool down, It melts before you can pull your hat down all the way. Sweat has pooled around your sunglasses, your armpits, the backs of your knees. A migraine is coming. Or heat stroke. Maybe both. You chug another bottle of water and get excited as the bright orange floater briefly disappears beneath the water’s surface until it bobs back up again and you realize it’s from the wave of a passing boat probably heading to a better fishing spot. Guess what, it’s still hot! The best bait is gross, live and wriggles. You have to catch it to jam a hook through it in order to catch a bigger fish…and while it’s still wriggling! I have yet to stomach even putting a live shrimp on my hook. I’m such a chicken! I get my son or my husband to bait the hook for me. Last week I resorted to using a leftover lunch roll and made tiny dough balls. They didn’t move and I did catch some little Blue Gill, so it wasn’t a total bust. Chopped up pieces of hot dog and pork fat work too for too, but you won’t catch a prize-winning Bass with that kind of bait! And when your husband cuts up a fish as bait, it’s all guts and gore. It stinks. It’s nasty. No amount of hand sanitizer will get rid of that smell. 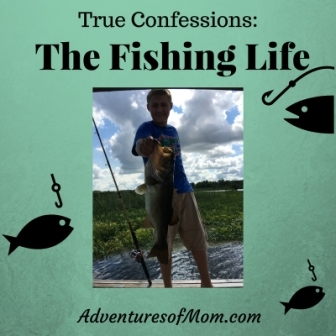 True confessions about family fishing- the whole stinking truth! When you actually catch something, then comes the heart-pounding thrill that makes fishing a sport. A fear, and excitement. What will it be? A struggle of wills and power. While pulling in a 2 inch Blue Gill may not garner a sniffle, grown men have been brought to tears recalling their 6-foot shark. Fighting the marlin. Hemingway wrote an entire book about it (old Man in the Sea). It’s that ultimate catch or the desire for that perfect fish that keeps you going back for more. If your catch is big enough – you get the selfie moment and get to take it home and eat it. If not, you still might go for the selfie anyway before tossing it back to its freedom- once you take the dang hook out of its mouth! If your catch is a Catfish, no matter how big, everyone groans and walks away. No one wants a Catfish. The whiskers can sting you, so you have to be very careful when extracting your hook from their mouth and they make this creepy grunting sound which sounds like someone trying to clear the phlegm from up their nose via their throat. Yeah, creepy. 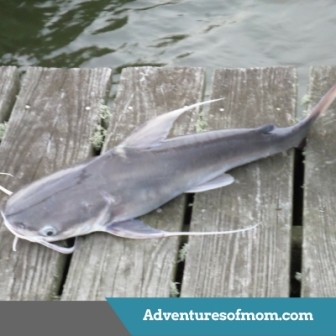 Catching Catfish usually mean all the good fish have vacated the area. So should you. Fish are never easy. They don’t want to get caught. They don’t expect to get caught and they certainly didn’t think that tasty-smelling shrimp had a jagged piece of metal jammed inside of it or they may have reconsidered trying to swallow it in one go. Sometimes getting your hook out of a fish is an easy jiggle and wham, it’s free, other times it is more like a surgical procedure requiring long needle nose pliers, a rag and extra caution if it’s a catfish. Either way, you are gonna smell like fish in the end. The truth is: No one really wants to catch a catfish. The truth about fishing and our family is my husband is gung-ho, my son likes to catch, our daughter hides in the shade, listening to music and I give it 30 minutes maybe before getting distracted by taking photos and then like that dog in the Disney movie UP — ooh look- bird! At the day’s end, we are far from a glamorous outdoor family magazine cover, no we are usually sunburned, wind-chapped, rumpled, and in disarray, with me having to take some migraine medicine (I just carry it along now), and of course, we all inevitably smell like fish.